Earlier this year, Maya Ramirez put Toledo, Ohio, on the map among fashion designers and those who follow them. The 15-year-old sophomore, who attends the Toledo School for the Arts, won the first season of “Project Runway: Junior”! As the victor, Maya received a full scholarship to the Fashion Institute of Design & Merchandising, a sewing studio, a feature in Seventeen Magazine and $25,000 to help launch her fashion line. Maya went on to show her first collection as Maya René at Vancouver Fashion Week in September. I got to experience her pieces firsthand Dec. 2 at Ragazza Boutique in Sylvania, Ohio. The local women’s store hosted Maya and her collection during a First Friday Art Walk. That night, my friend, Gina, and I braved the cold and ventured down Main Street. Lucky for me, I hardly noticed the dropping temperatures as I wore the WARMEST sweater I’ve ever owned. This furry pink thing is from Banana Republic and it’s my new must have for Midwestern winters. I’m not sure how many times I said to strangers, “Come on... you know you want to touch it.” It’s SO soft! Plus, the free glasses of wine didn't hurt! Why have we not come to First Fridays before?! Shopping, wine, music, art... It's a fabulous way to end the week. 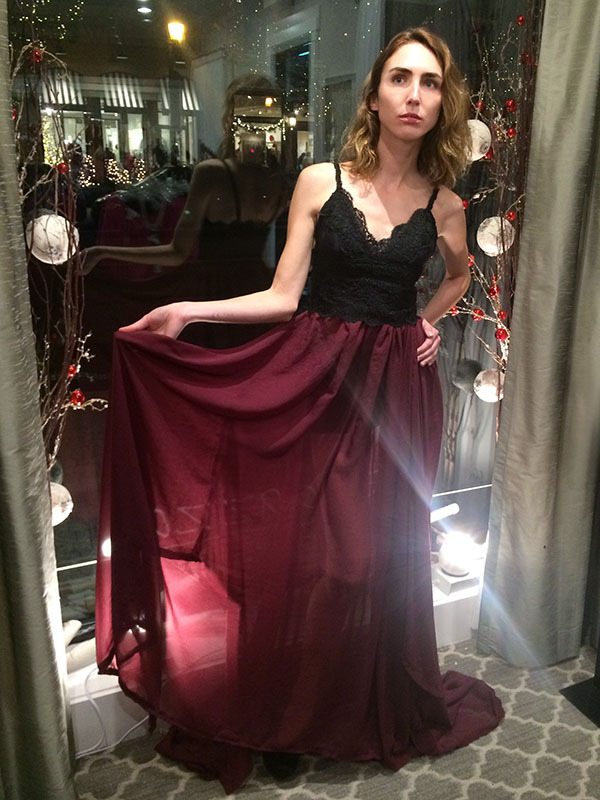 We made our way to Ragazza, where local models were showcasing Maya’s designs in the store windows. Inside we had the opportunity to view the pieces up close and feel the textures of the garments. Her collection is comprised of elegant fabrics, contrasting textures and unique shapes with a gothic edge. Later, I read that she was inspired by Greek and Roman architecture, the Victorian ages, modern silhouettes and chrome fabric. We also got to meet the designer, herself, who was eager to see fellow fashionistas and share her awesome story. I learned that while she’s stoked about the scholarship, she’s keeping her options open and hoping to visit some schools before making a decision. Ultimately, she would love to have her own high-end women’s wear company, return to New York Fashion Week and dress celebrities for special events. So the next time you hear of Maya René might be on “E! Live from the Red Carpet” as the host asks Zendaya who she’s wearing. Maya calls the young actress and singer one of her fashion icons. I really enjoyed meeting Maya and experiencing her collection in person. I was impressed by the teenager’s unique approach, respect to her own aesthetic and warm disposition. One of the models mentioned that she offers custom-made pieces at reasonable prices. I plan to take her up on that! I think it’s important to support fellow women and shop local, so I would be delighted to flaunt a Maya René creation made just for me. To learn more about Maya Ramirez and see more of her creations, visit her website at www.mayarene.com.